"It’s better to give than it is to receive.” This belief can run deep in many of us. Are givers nicer, more caring, more accepted people?? This certainly is the perception if you compare how we as a society view the “takers” of this world. Therefore many of us, (especially females) are givers. We are nurturers by nature, so we give...and give. Giving is a way we show love. We give at work, to our children, and we give to our significant others. I’m not here to say that giving is a bad thing or that anyone should stop doing it. I am a giver! I’m not here to talk about the kind of giving that brings you pure joy. If joy is part of the equation, there is no problem right? This post goes out to those of you whose obligations are piling up, and you’re feeling overwhelmed and in sacrifice. This post goes out to those of you who are unhappy with the lack of “balance” and satisfaction in your relationships. I’ve had to take some honest assesments about “giving” in my own life. I realized that “receiving” was uncomfortable for me, and in a way I had attached a certain weakness to it. I did not like being dependent on anyone. I’ve been opening up my willingness to “receive” now. I attach “giving” as a way I show my love. So in my love relationships I give my attention, my encouragement, and my respect, to the other. Sometimes however, my giving was lopsided. I wasn’t receiving many of these things in return; things I wanted for myself. I’ve often equated this behaviour with a willingness to accept crumbs when you are hungry for a loaf of bread. Why the hell would I do this, accept less than I feel I want or deserve? Fear is my obvious answer. So I took a good look at what it was I was afraid of in life.... Fear of being alone. Accepting this fear exists and saying it out loud has made all the difference for me. I’m still a giver, but I am an equal receiver and I like it! I now see that facing and accepting ANY fear you have can make a difference. Whether you are afraid of NOT having that relationship, being thought a slacker at work, or you are afraid of being judged as not a good parent. We teach people how to treat us by the way we treat ourselves. It is not THEIR fault. If my significant partner expects me to be there without feeling the need to be there for me in the same ways, it is me who has taught them this. If work expects me to work through lunch, dinner, and through weekends without care for my own physical and emotional needs, it is me who has not drawn that line. If I continually offer my help with that next fundraiser despite my own needs for rest and relaxation, it is me who teaches people that I will. 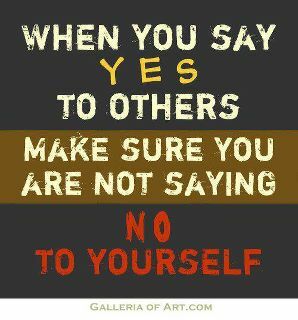 It is ME who must be willing to give to myself before I can expect others to do so. It has been so freeing for me to see life in this way. Making changes in myself is much easier than blaming others and waiting for them to change. We all know waiting for others to change so that we can be happy....can be a long, long...wait. Patty Sherry is the founder of Share Your Love Story and is a Wellness and Love contributor at The Blog Entourage. You can find more inspiration from Patty on her blog Share Your Love Story. I'm an odd female. I have absolutely no problem saying no to anything or anyone. I hate shopping, can't cook, am a minimalist when it comes to decorating, and never understood this weird passion for...shoes. I'm pretty bad about saying no whenever I'm already spread too thin, but I've been working on it lately and am getting better! I am soo bad at saying no. I never do it and I am always spread to thin... I say no to going out though with ppl, I am a HUGE homebody.. I do have a problem with saying no. What a great post! I know I need to hear this every so often.